Today's Wall Street Journal (WSJ B1) offers an insight into the costs of brokers. Average broker charges per advisor are $305,963. This can be compared with average fees from Vanguard of $33,841. LPL FINANCIAL HOLDINGS INCL (The Wall Street Journal "Broker's Share Take a Beating", WSJ, March 26,2016, B1) shows that LPL Financial Holdings ($24.30/share) reports fee income of $4.3 Billion to manage client assets of $475.6 Billion. The LPL fees were earned in support of investor management work performed by 14,054 advisors. 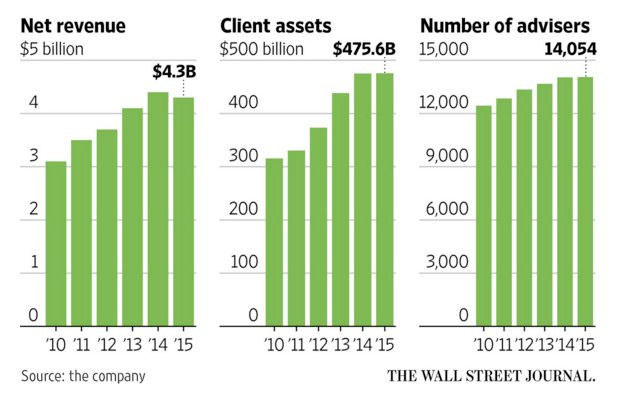 A LPL staff of 3,410 manages client assets. The average annual fee for LPL Financial Holdings holdings, per advisor, was $305,963 in 2015. That supports average assets, per advisor, of $33.8 Million. A comparable Vanguard average management fee for Admiral funds is about 0.10%, ranging from 0.05% to 0.3%. If Vanguard would administer the total investor holdings of $33.8 Million, that would constitute approximately an annual fee of $33,841. In addition for compensating LPL Financial Holdings for average administrative costs of $305,963, advisors would be charging an additional fee of at least a 1% of up to 2% fee for portfolio management. In cases where investors would not take advantage of the economies of scale available to LPL, the costs for individual administration of a investor portfolio could be even higher. It is now apparent that trusting portfolio management to an advisor can not be attractive at present. The expected investor investment returns according to prof. Shiller from Yale are close to zero. As a consequence, only investment advisors would be gaining from portfolio management, not the investors.